Property developers and estate agents are among some of our more regular clients. An umbrella is often required when managing and conducting viewings for prospective buyers. It provides a great space to promote your brand as well as protect the user from the rain between property viewings. It offers a number of subtle nuances which provide an assumption about the quality of service you offer, without you having to spell it out through a thoughtfully produced umbrella. Use of clever or dramatic artwork can set you apart from your competitors. We’ve produced some beautiful work for clients recently. The Parisian and London skylines on umbrella panels as illustrated below, are fine examples of how striking an umbrella can look. A powerful piece for Rathbone Place, used a map of London on the internal canopy which was carefully hand-crafted to match the artwork perfectly. 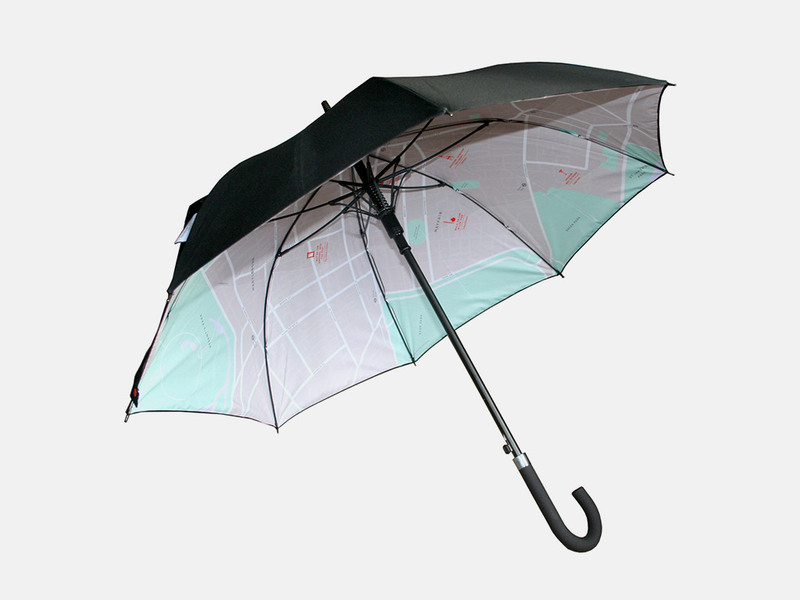 The finishing on this umbrella also included a label on an external panel plus a Pantone-matched button on the tie wrap. Other options to consider when thinking about a super-looking premium umbrella are an engraved handle or bespoke carry case.